Gold bullion refinery uses multiple smelting techniques intended to separate pure precious metal from alloy metal mixes. Before any smelting is done, all pieces are carefully assayed and tested to determine gold’s purity and composition. Your former jewelry or dental gold is put through multiple stages of gold refining process to get to the purest form of yellow precious metal that is used for making various bullion products. While most refineries will not pay you any money for precious stones that might be attached to your jewelry, some will provide stone removal services at about 2% fee from the total pay out amount and offer you money on the spot for the stones that would otherwise go to waste. If some of your scrap jewelry contains gem stones that have value to you, most refineries recommend you remove them before turning in your pieces to them. Otherwise you are not going to get any money back for them because they will be vaporized during melting; try reselling them to a jewelry dealer or at an online auction. Additionally, most refineries do not deal with plated pieces, however, some of them do utilize reverse plating technology to collect precious metals and provide the top cash pay outs. 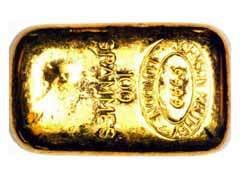 Gold bullion refinery agencies are also the best places to buy bullion bars that could be fully or partially traded in for your scrap metals price. There you can additionally purchase gold bullion coins or bars with guaranteed authenticity and unsurpassed quality. A precious metals refining company can inform you about gold bullion price today so you can determine what payment method you prefer, to trade in your scrap pieces for bullion or take cash. At gold bullion refinery you can choose any gold bullion weight product to match your investment needs starting from 1 oz gold bullion and all the way up to one kilogram bullion bars. Find a local gold bullion refinery to take your unwanted precious metal pieces in or choose from a number of reputable online refinery sites for hassle-free scrap into bullion recovery. As a final note, please make sure to check the spot prices of precious metals on the day of the transaction to ensure you are getting at least 85-90% of the actual metal content worth.